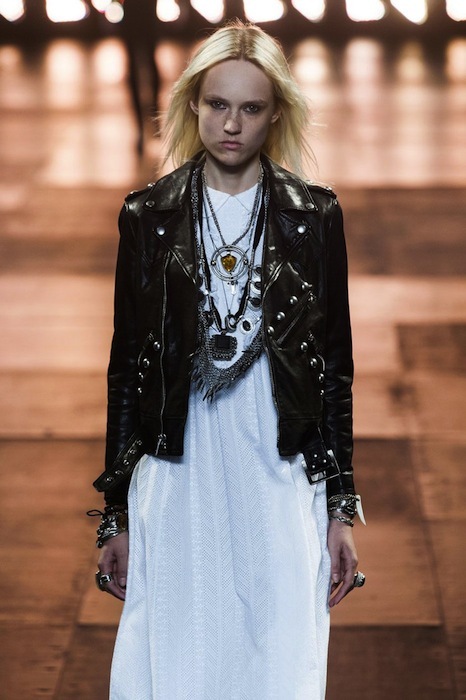 Saint Laurent is bringing an indie rock and vintage flair back to their Menswear Spring 2015 collection. Iconic and glamorous styles from the 60’s and 70’s are proudly displayed with a coolish L.A. twist, going back to the time when everything needed a hint of rock n’ roll. The girls on the mens runway seem to be the rage this season in Paris, and this collection’s bohemian-striped number is definitely a winner. Flashbacks to a hippy-dippy era are obvious in various styles of desperado-styled hats, vests, skinnies and lots of metallic details. Layers of jewelry complement the studded leathers adding a a Western (slash rocker) flair, with Colonial velvety jackets turning back time even further. The embellishment is seen throughout this lineup, including a velvet piece with gold firework-like embroidery, a sure-fire showstopper for menswear trends. The menswear collection for spring 2015 is a nod to American Hollywood Rock Icons with a western flair, maintaining the high fashion details of the iconic house. fdmLOVES SAINT LAURENT menswear spring 2015 selects by Brigitte Segura, written by Arielle Tipa.